I never have enough of curries, be it Indian or Thai…sometimes even just in a normal stew…have to have that little hint of curry! 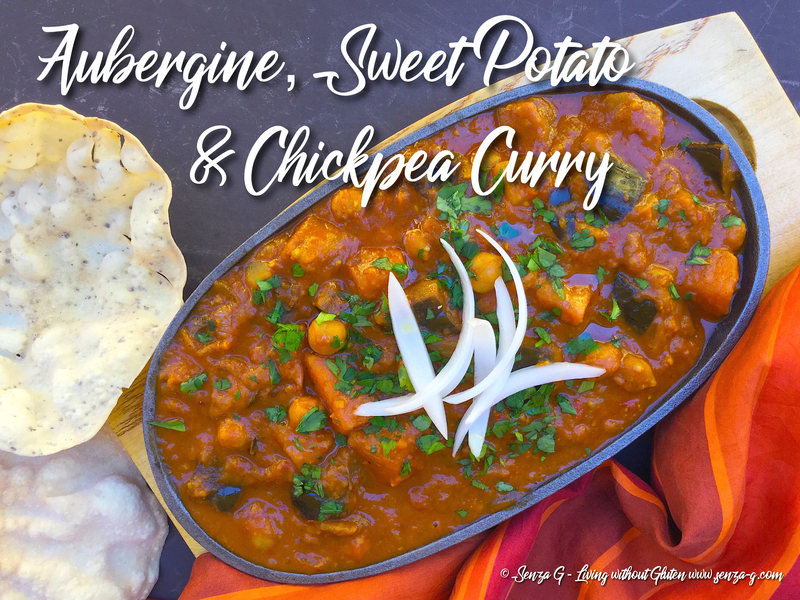 This Aubergine, Sweet Potato and Chickpea Curry is great for both vegetarians and vegans and also for the meat lovers, try it … makes a nice change! In a large pan, saute the onion in a little oil until translucent. In the meantime, in another small dry pan, heat the cumin and the coriander seeds until fragrant. Leave to cool and then grind in a coffee grinder. Add the diced aubergine, both of the diced potatoes, the garlic and the ginger to the pan. Cook for a few minutes then add all the spices including the whole cardamon pods and freshly ground cumin and coriander. Combine well with the vegetables. Pour in the passata, the tomato paste, the sugar and the stock and combine with the vegetables. Bring to a boil, lower the heat, add the chickpea and leave to simmer for about 10 minutes. Stir in the coconut milk, combine and cook until all the vegetables are cooked. Sprinkle the fresh chopped coriander leaves over the top. Serve with boiled Basmati Rice and Poppadums. * You can use ready ground coriander and cumin if you wish. But if you have a coffee grinder, do grind them fresh… makes a difference.